On Sept. 14, United Technologies CEO Greg Hayes said the company will announce a decision within 60 days about whether to break up. The company’s main business lines are comprised of aerospace engines, elevators and building equipment such as air conditioners. Chubb was acquired by United Technologies for about $1 billion in 2003, and is now part of the company’s climate, controls and security division. It has been playing catch-up for market share with rivals Securitas AB and Tyco International Ltd. Tyco was acquired by Johnson Controls International Plc two years ago for $16.5 billion. United Technologies, based in Farmington, Connecticut, has hired Bank of America Corp (BAC.N) to run an auction for Chubb, the sources said, asking not to be identified because the matter is confidential and cautioning that no deal is certain. United Technologies did not respond to a request for comment, while Bank of America declined to comment. United Technologies, maker of Pratt & Whitney engines, Carrier air conditioners and Otis elevators, has a market capitalization of approximately $113 billion. Chubb, headquartered in Britain, provides fire safety and security solutions for businesses and organizations around the world, although its business is predominantly in Europe. Hayes said at an investor conference this month that United Technologies planned to close its pending $23 billion acquisition of aerospace parts maker Rockwell Collins (COL.N) by the end of this month. That deal has been held up by China delaying regulatory approval, amid an escalating trade row with the United States. Investors have increasingly shunned sprawling industrial conglomerates, forcing peers such as General Electric Co (GE.N) and Honeywell International Inc (HON.N) to also announce the sale or spinout of major divisions. Activist investor Bill Ackman’s hedge fund Pershing Square Capital Management LP and Daniel Loeb’s hedge fund Third Point LLC have been putting pressure on United Technologies to break up into three focused, standalone businesses. SAINT PAUL, MINNESOTA — Summit Companies, a premier fire and life safety company, announced it has completed the purchase of Clark Fire & Safety, Inc. (“Clark Fire”) in Owosso, MI, Mid-Michigan Fire & Safety Supply, Inc. (“Mid-Michigan Fire”) in Greenville, MI, and Providence Fire Protection, Inc. d/b/a VanEx Fire Systems (“VanEx Fire Systems”) in Luna Pier, MI. These acquisitions are a strategic geographic expansion of Summit’s existing fire protection, life safety and consulting business in the state of Michigan. Summit Companies currently has branch offices in the states of Arizona, Iowa, Michigan, Minnesota, Nebraska, Nevada, North Dakota, and Wisconsin and performs work across the United States. Clark Fire was founded in 1989 by Edward Clark and focused on portable extinguisher sales and service. Edward’s son David became the second generation owner of the business in 2006 and expanded Clark Fire’s offering to include industrial and kitchen suppression systems and fire sprinklers. Gary Templar established Mid-Michigan Fire in 1997 and focused on fire extinguisher and kitchen suppression system sales and service to commercial and institutional customers in western Michigan. Mid-Michigan will be integrated into Summit’s Mount Pleasant, MI branch office. Established by John Van Develde in 1977, VanEx Fire Systems initially provided fire extinguisher sales and service. Matt Miklovic purchased the business in 1997 and quickly expanded the product offering by adding carbon dioxide and clean agent systems, detection & control hardware, special hazard suppression and fire alarm systems to more broadly serve its commercial, industrial and institutional customers. Summit Companies will retain the staff and technicians of Clark Fire, Mid-Michigan Fire and VanEx Fire Systems. The current offices of Clark Fire in Owosso, MI and VanEx Fire Systems in Luna Pier, MI will become new branch offices for Summit Companies. SAINT PAUL, MINNESOTA — Summit Companies, a premier fire and life safety specialist company, announced that it has completed the purchase of A-1 National Fire Co. of Las Vegas, Nevada. This acquisition is a strategic geographic expansion of Summit’s existing fire protection, life safety and consulting business. Summit Companies currently has locations in the states of Arizona, Iowa, Michigan, Minnesota, Nebraska, North Dakota, and Wisconsin and performs work across the United States. The company’s roots date back to 1978 when co-owner Mervyn (Merv) Loughmiller started working for a family friend that owned a small fire extinguisher business in Hawaii. In 1991, Merv moved to Las Vegas and started National Fire Protection Company and subsequently purchased a sprinkler company in 2003 renaming the business A-1 National Fire Company. Co-owner Ken Young entered the fire protection business in 1996. In 2003, Ken and his wife Tiffany founded All American Fire to focus on sales and service of portable extinguishers and pre-engineered suppression systems. Ken and Merv merged their businesses in 2006 and renamed the company A-1 National Fire Co.
Today, A-1 National Fire Co. offers the following fire protection and life safety services: fire alarm installation, inspection & repair, kitchen range-hood suppression systems installation, inspection & repair, kitchen exhaust cleaning, fire extinguisher sales, service & installation, fire extinguisher training classes, fire hydrant inspections, testing & repair, back-flow preventer inspections, testing & repairs, fire pump weekly/monthly runs & annual maintenance, and total flood system installation, inspection & repair (halon, alternative clean agents, dry chemical systems, foam systems, CO2 systems). With the additional resources of Summit Companies, the company plans to expand its offering by adding complementary fire life safety services. 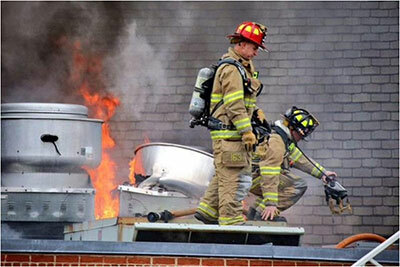 PORTSMOUTH — Contractors blamed in a federal lawsuit for a massive 2015 fire at the Portsmouth Gas Light Co. argued in court filings that restaurant employees were responsible for the blaze that caused more than $1.7 million in damage. The Patriot and Harleysville insurance companies filed suit against Tri State Hood and Duct, its affiliate Tri State Fire Protection, and Portsmouth Steam of Rye. The insurers claim fire damage at the Gas Light was “caused by the gross negligence, negligence, carelessness and/or negligent acts” by the contractors, who were paid to inspect, maintain and clean the restaurant’s commercial kitchen hood and ducts prior to the fire. Originally filed as separate lawsuits and now consolidated as one, the litigation seeks to recover the insurers’ costs for claims paid to the Gas Light. In a May 29 filing to the court, by all the parties, it is reported that the Harleysville insurance company paid more than $1 million and Patriot paid more than $750,000 in fire-related claims. The court has assigned the dispute to its “complex” docket and scheduled a trial date of Jan. 22, 2020. Tri State Fire denies liability and informed the court it inspected the Gas Light’s fire-suppression system July 17, 2015, when the system passed the inspection. That company, as well as Portsmouth Steam, alleges the fire was caused by negligence or omissions by Gas Light staff. Fire Chief Steve Achilles told the Herald, the day of the fire, the blaze started in a duct for a wood-fired oven and burned up through the roof. Four months after the fire, Gas Light owner Paul Sorli said he had insurance protection for six months of business losses, including keeping his managers on the payroll, while the business was closed. When he reopened a year after the fire, Sorli said it took 12 months, $2.5 million and help from restaurant staff, contractors and a local bank to get the building repaired and the business reopened. Sorli also said the fire suppression system for the wood-fired stove failed to activate.